WIS and Soothe Healthcare Conformed Cooperation of IDHPF 2017-WIS Consulting Ltd. 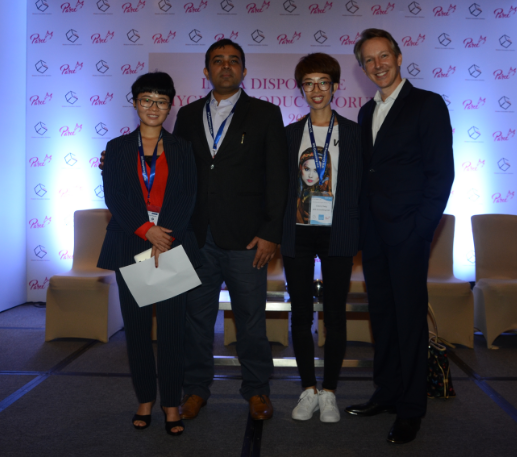 In June, after several times communication, WIS Consulting Ltd. and Soothe Healthcare confirmed the partnership to organize high level disposable hygiene products industry events in India annually. It was a milestone for us to start the series plans of Asian countries events. Founder&CEO of Soothe Healthcare Sahil Dharia, who has over 15 years of experience setting up, scaling & leading complex global financial services businesses with multinational's as well as launching an FMCG entrepreneurial venture, seed funded by an iconic Wall Street investor. At the time of founding Soothe Healthcare, Sahil Dharia was the Global Head of Operations, Investment Research Content, at Thomson Reuters, supporting operations with US$ 200 mn revenue footprint. Sahil helped setup & rapidly scale Reuters, Bangalore to peak size with emphasis on building management depth. He launched his first entrepreneurial venture at age 21. This entrepreneurial streak & solid operations experience motivated him to startup Soothe Healthcare that has received phenomenal media attention owing to its disruptive product portfolio in affordable healthcare. Sahil is a member of IMA’s CEO Forum- a peer group of the top 1000 CEO’s in India & FICCI Young Leaders. He is passionate about building thought leaders & serves as visiting faculty at leading educational Institutions. Sahil studied Economics at the Zicklin School of Business, New York, NY, is a charter member of TiE startup community, committee member at Ennovent, an Innovation Accelerator & Investment Fund & Member of Executive Council CII Young Indians. With the support from Soothe Healthcare, we have great confidence to organize more high quality conferences to build a business bridge for hygiene industry.